Tárkány Művek (Tárkány Works) is a group of young musicians from Budapest, Hungary who, according to their website, "weld the raw energy of traditional Hungarian folk, the intellectual rigour of classical music, and the spiritual depth of avant garde jazz and poetry." Not knowing the language, it's hard to tell about the poetry and spiritual depth, but there's certainly something of jazz here, particularly in the sax solos of Gergő Kováts. "What we would like to achieve," says band leader Bálint Tárkány Kovács, "is to transform contemporary improvisative music – that is often called jazz – in a way that it becomes more Hungarian. We will forge rhythmic arrangements, melodic progression, ornamentation, and lyrics into an organic whole." There's a lot of traditional Hungarian music here, including this track, the title of which translates as "So Much I Love You," sung by Julianna Paár in a way that reminds me more than a little of Márta Sebestyén from the Hungarian folk group Muzsikas. Enjoy your introduction to Tárkány Művek! Live version of a song that appears on the album Introducing Tárkány Müvek. Check out the Soundcloud link below for more samples. Some of the songs are manic flurries, others (such as "Csak egyszer voltam boldog / Once in my Life I Was Happy") are slow, melodic, and somber. And don't miss "Nyisd ki babám / Open up Baby" -- a Hungarianization of the jazz standard "On the Sunny Side of the Street." I've only just been introduced to Tárkány Művek, but I feel certain I'll have more than a passing acquaintance with their music, a jazzy take on an already engrossing musical tradition. Top 10 Global / "World Music" CDs of the Month! 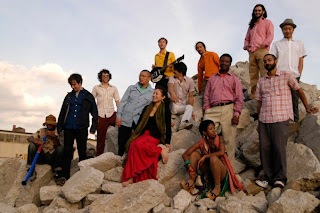 Monday's mp3: Kickstart Akoya Afrobeat! SoundRoots doesn't do a very good job hiding our love of Afrobeat. But then, why should we? More Afrobeat groups are popping up around the landscape, and established groups are showing staying and innovating power. Which brings us to the subject of today's post, Akoya Afrobeat. I first ran across this NYC-based group with their 2004 CD, Introducing the Akoya Afrobeat Ensemble. The group currently includes 15 musicians from around the world (Nigeria, Benin, Botswana, Japan, South Africa, and the USA), showing something of the universal appeal of the music and its vibe of resistance to (abusive) power. And its danceability, always its danceability! Akoya followed up in 2008 with the sizzling P.D.P (President Dey Pass) -- and now another four years have passed, they're ready to record again, and they're looking for your help. I'll leave you with a full track of Akoya's wonderfulness, and hope it entices you to support the band's project -- and to support (or form!) your own local Afrobeat group. I'm thinking about bugs today. Well, still thinking about them. If you caught last week's episode of Spin The Globe, you'll understand why. And if you didn't catch it, then you missed this, um, gem from a certain Liberian Congress-Woman. I'm sure I've written about Malinda Parker before, but it's worth mentioning her again for those who may be new to SoundRoots. Or those who just want something different -- very different -- to grace their earbones this week. Others have compared Parker to Tom Lehrer and Nina Simone; I'd put her in close company with Joseph Spence as well. She pounds on the piano with no small skill, and sings a coherent melody, but it's all teetering on the edge of madness in a most fascinating way. The generous listener may find her eccentric; others may think she's just nuts. But she's certainly entertaining. This 5-song album includes a longer(!) version of this anti-mosquito public service announcement, in which she creates several new ways to pronounce Rachmaninov while playing something based loosely on his music. This shorter version has more of a tipsy-ragtime-calypso feel, and she manages to say the word "cousin" more than 200 times (someone else did the counting, not I). 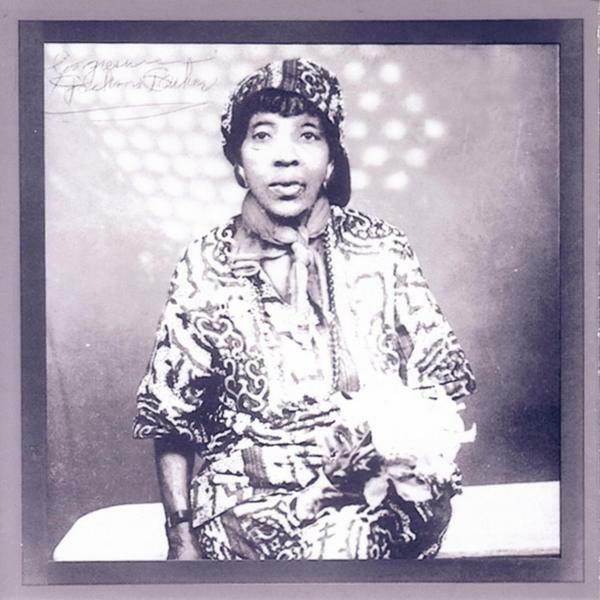 from "Tubman Goodtype Songs of Liberia"
If you need more Parker, check out the compilation Songs of the African Coast: Cafe Music of Liberia, which is where I first heard her, performing several songs with the slightly more subdued piano work of Prof. Howard B. Hayes. Parker indeed was, by the way, a member of Liberia's House of Representatives during the administration of President William V. S. Tubman. Monday's mp3: Oh, Those Golden Horns! So... I have a horn-shaped hole in my heart this week. Fortunately, the new album from Markovic and son is just the thing to fill it. 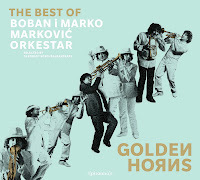 Not new material, this CD called Golden Horns, but something of a greatest hits things, with material drawn from Devla, Go Marko Go, Boban i Marko, and various other albums and remixes (Frank London, Robert "BalkanBeats" Soko, and Dunklebunt have their fingers in this pie). Informative liner notes accompany the music. The biography of Boban Markovic tells how easily distracted he was as a child, straying from the family tradition of musical performance (passed down from his father and both grandfathers). Aspiring musicians who've been told by their parents that they should choose a more practical career path may be amused by the story about how Dragutin Markovic had to sit down with 10-year-old son Boban and lay down the law. His destiny, dad insisted, was the trumpet. We can all be thankful for that talk, thought Boban never had to have a similar talk his own self-motivated son Marko, who taught himself his father's songs, joined the touring band at 14, and was given creative control of it on his 18th birthday. Today, this family has sprung some of the most delicious Balkan brass music to grace my earballs, from the swing of "Rromano Bijav" to their speed-brass version of "Hava Naguila." If you don't have their other albums, this is a fantastic place to start. If you do have the rest of the discography, well, you should still get this. Here's one you can dance to.